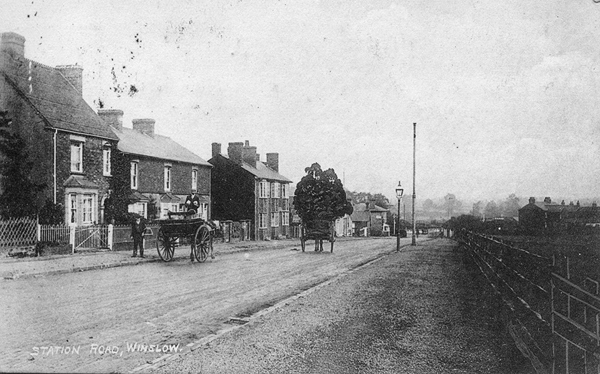 The arrival of the railway in Winslow led to the development of Station Road to the north of the existing town. Along with the turnpike and the building of the Workhouse, this completed Winslow's realignment on a north-south rather than east-west axis. The land for the railway itself was acquired by the Buckinghamshire Railway Company in 1847-8. In 1849 they bought nearly 8 acres more from the Selby-Lowndes estate to provide the site for the station and sidings, and the access road which became Station Road. Below is a plan of the land they bought in 1849 on the left (coloured pink) and the equivalent land on the 1880 map on the right (the top is roughly north-east). 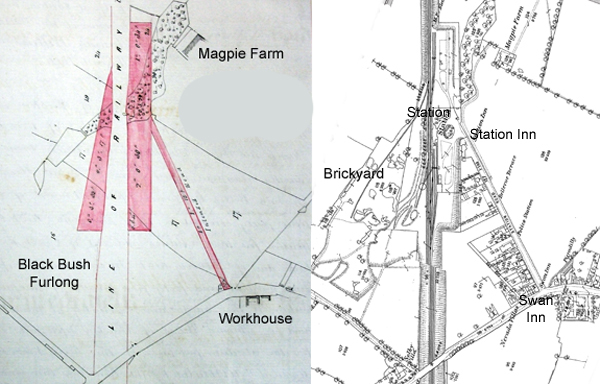 The railway and new road sliced through several fields and The Spinney (some of which survives). WHAT A RAIL DOES AND DOES NOT DO. 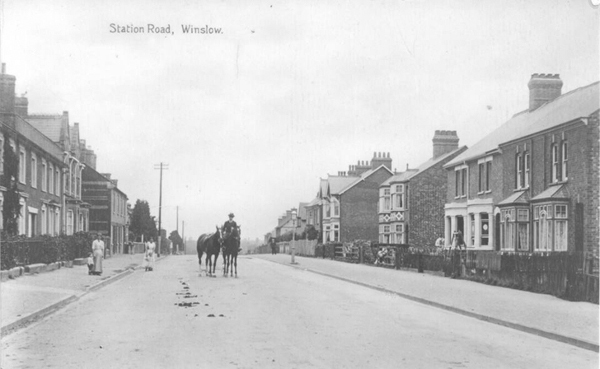 – As evidence of the extraordinary changes, and increase of wealth, created in some towns by which new lines of railway pass, we may state that, at Winslow, about 30 capital houses have been built within the last few months – and, as evidence of what blind bigotry, folly, and political tyranny can do elsewhere, there has not, as a result of the introduction of the railway at the town of Buckingham, been so much as an extra brick wall, mud-hut, or pig-stye built, unless for railway purposes. 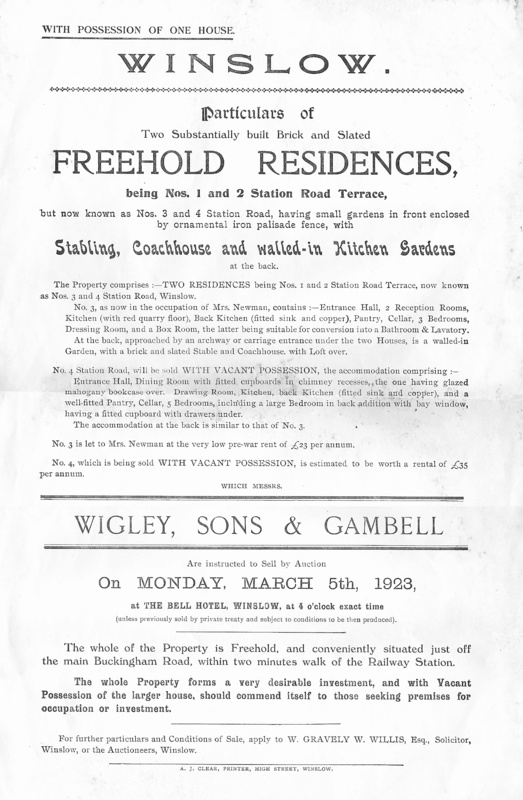 The three sale notices below show how the property market developed in the 19th century (click on the images for the whole documents). All four houses built by Thomas Foxley, 1851/2, and mortgaged by him. c.1871-6 no.1 was a school kept by Sarah Williams. Sold in 1886 by Misses Eliza and Martha Walker of Lenborough (who had foreclosed on the mortgage) to William Vincer Minter, Master of Winslow Workhouse for £750 (price for nos.1 and 3). Purchased from Mr Minter's executors in 1896 by Elizabeth Vincer Cuthbe, widow, Matron of Birmingham Workhouse, for £710 (price for nos.1 and 3). She was Mr Minter's daughter. Purchased from Mrs Cuthbe's executors in 1911 by George Ingram and his wife Jane Woolhouse Ingram for £630 (price for nos.1 and 3). Leased by George Ingram and his wife Jane Woolhouse Ingram in 1913 to Winslow Board of Guardians for 14 years for use as a children’s home, rent of £26 p.a. No.3 was sold by Mrs Ingram to Miss Elizabeth Ingram in 1914. 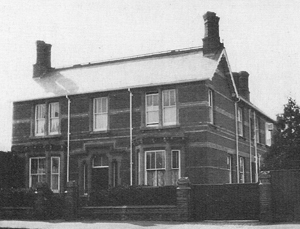 The children's home closed in 1938 and the house was let to Charlie Walton, stoker at Winslow Hospital, and his family. He and his wife Rhoda lived there until 1966. In 1949 Bucks CC said that it might in future be used as a children’s or old people’s home (which never actually happened). In 1950 they were asked to grant a tenancy to Winslow Hospital Management Committee. Sold by Bucks CC to the Ministry of Health in 1954 for £1,500. Sold by the Secretary of State for Social Services to Howard Quilter of Prestwood in 1969 for £3,100. Converted into four flats which were leased by Station Road Residents Association in 1976. 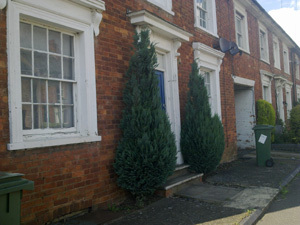 According to www.rightmove.co.uk, Flat 3 was sold for £120,000 in 2006 and Flat 2 for £125,000 in 2004. Full details of all the deeds in the archive (Word document). The gasworks were built in 1880 on some of this land, next to the station, replacing the gasworks in the High Street built in 1843; the Gas House, where the manager lived, and Gas Cottages are still there. See Mrs Lambourne's funeral, 1899 for some information about one of the inhabitants of no.33. 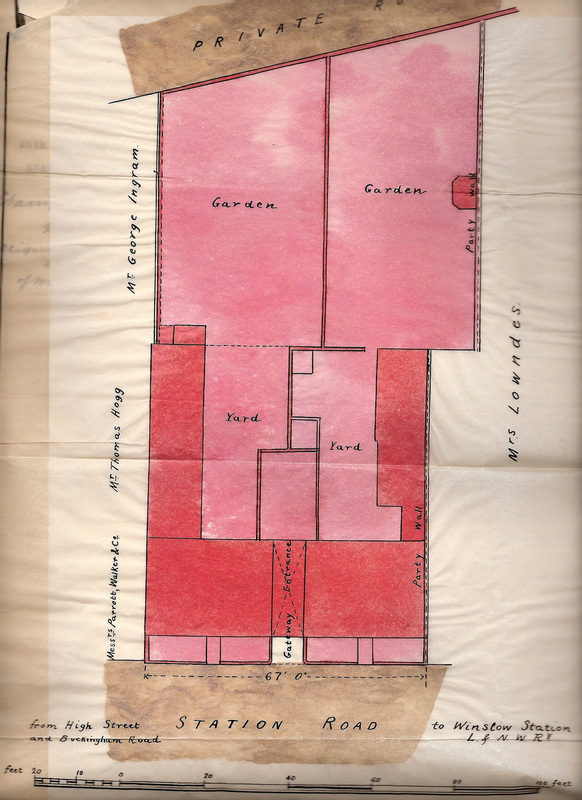 Plan of the gasworks site from the 1880 conveyance. "Hollow" and "Coal Yard" are now McLernon Way. NEW GAS WORKS. These are now in course of erection on a piece of ground adjoining the London and North-Western Railway Station. Mr. George Bowyer of St. Neots, Huntingdonshire, is the contractor for the iron work; Mr. Frederick Roads, of Winslow, for the gas-house, and Mr. George Gibbs, of Winslow, for the manager's house and office. Under the Gas Act 1948 the assets of the Winslow New Gas Company passed to the Southern Gas Board. Winslow R.D.C. granted permission for use of part of the site as a coal depot in 1958. On the left [in the photo above] was a single police officer's quarters, one-up, one-down. Behind the main door was the station office where you went through to get to the single officer's quarters. Also from the office you went into the cells area and from there into the courtroom. Also from the hallway to the cells etc as you went through on the right was a door that was always locked and this was an interior entrance to the sergeant's quarters, which were the three upper windows and the one down to the right of the main door, although there was another entrance on the side. Behind the building itself was a building that was once stables but in the 40s housed the police car. Part of this also doubled up as a coal cellar for the station. There was a storey above that at this time was never used for anything. There was also a three bedroomed house opposite this building. At the back of all this property was a footpath and over the footpath were some allotments one of which was owned by Clarence Smith a market gardener who also had a shop in the Market Square [now the Indian restaurant]. In those days there were three police officers for the Winslow area. 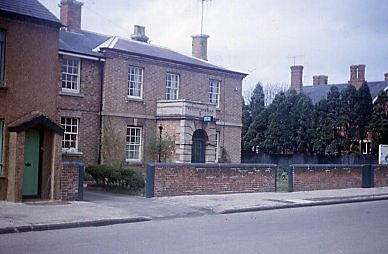 The house next to the Police Station, now Northolme, 23 Station Road, has been altered and the outbuildings were demolished in 2016 due to a development of new houses (now Claremont Close). The photo on the right shows how it looked before the brickwork was covered with white paint, which has now been removed again in a careful restoration of the Victorian exterior. The house was originally called Claremont, built by Charles Clare the coal merchant in the 1870s. He is listed there in the 1881 census with his wife Edith, 3 children and 1 servant. In 1884 it was valued by Wigleys for sale or mortgage to a Mr Pinham or Pinhorn (Centre for Bucks Studies D/WIG/2/1/12; valued again in 1887 for return to Mr Clare). The Lambton family lived there briefly c.1885 before moving into Redfield. In 1891 it had been renamed Northolme, and was occupied by Rolph Creasy, surgeon (general practitioner), his wife Mary, 2 children and 3 servants. Mr Clare evidently retained ownership until he was declared bankrupt in 1900 (Centre for Bucks Studies D/WIG/2/1/35). In 1901 the occupant was Major Fred Coates, "living on own means", his wife Alice and 2 housemaids. He was a J.P., and is still listed in the 1945 telephone directory (tel. Winslow 18). In the 1950s and 60s it was the home of R.R. Bugg the vet, whose practice was in Horn Street. The last owners were Joe and Margaret Lowrey; Mrs Lowrey's recollections of her rally-driving career are on the Oral History page. The side of the house became fully visible in January 2015 after tree clearing (photo on left). THE CREAMERY. 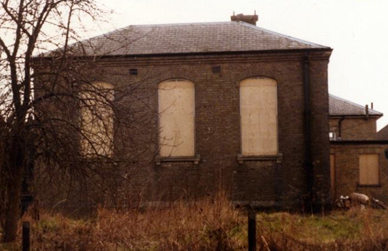 – The large building in the Station Road, Winslow, erected by Mr. John Ingram for Mr. F. C. Edmunds, of London, was opened, on Tuesday last, as a creamery, and promises to be a convenience to the neighbourhood. 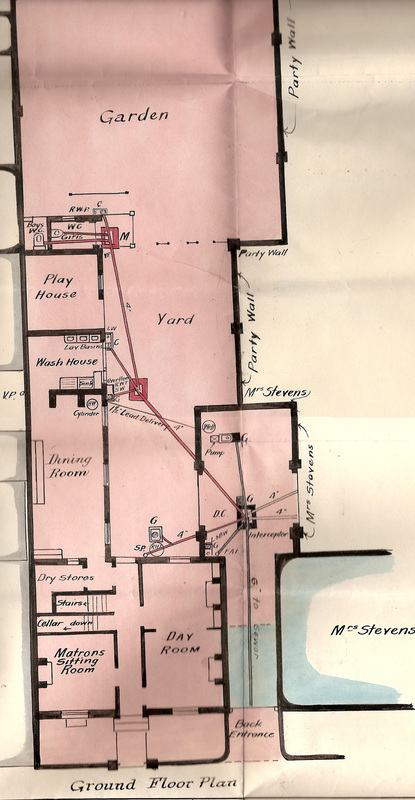 The internal arrangements are not quite completed, but the machinery comprises – Two large size De Laval’s patent separators, two refrigerators, double-acting steam pump, donkey pump, four-horse horizontal engine, and eight-horse boiler by E. S. Hindley, of Bourton, Dorset, 600 gallon cistern, churn washing apparatus, &c. Mr. T. Smith is the acting manager. The south side of the road was developed from the early 1900s after the sale of the "Station Building Estate" in 28 lots in 1900, and another sale of 11 remaining plots in 1904. The latter now form the row of houses starting from no.4. 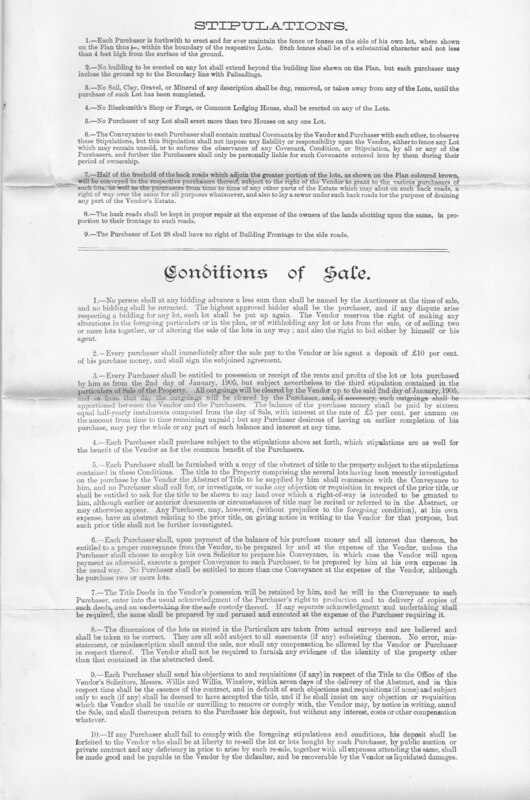 The conditions of sale prohibited building a blacksmith's forge or common lodging house. Click on the images below for the 1904 sale catalogue. 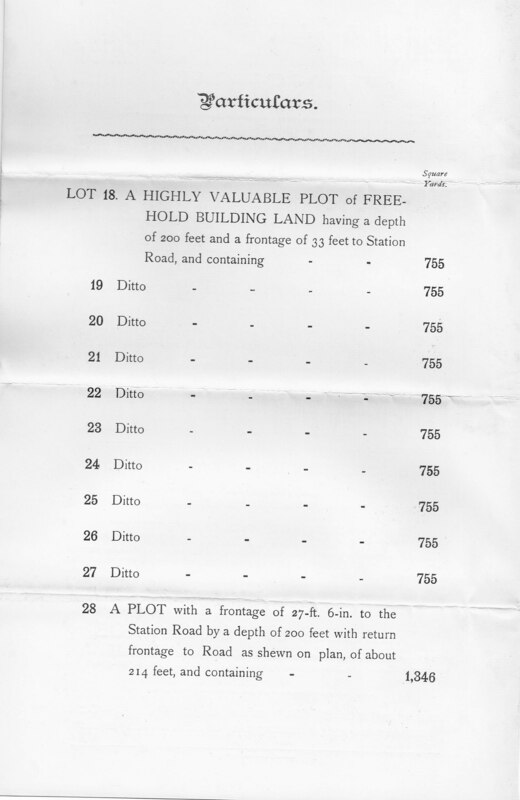 Most of the houses were built in pairs, and the sale of two of them (numbers 14-16) in 1940 shows some of the details (the building plot referred to is now the site of no.4). The sale of three small houses on the north side in 1942, along with houses in Avenue Road and the High Street and some "garden ground" which is now part of Courthouse Close, is recorded in another catalogue. Click on the images below for the whole documents. This view shows the road c.1906 before the last pair of houses was built. 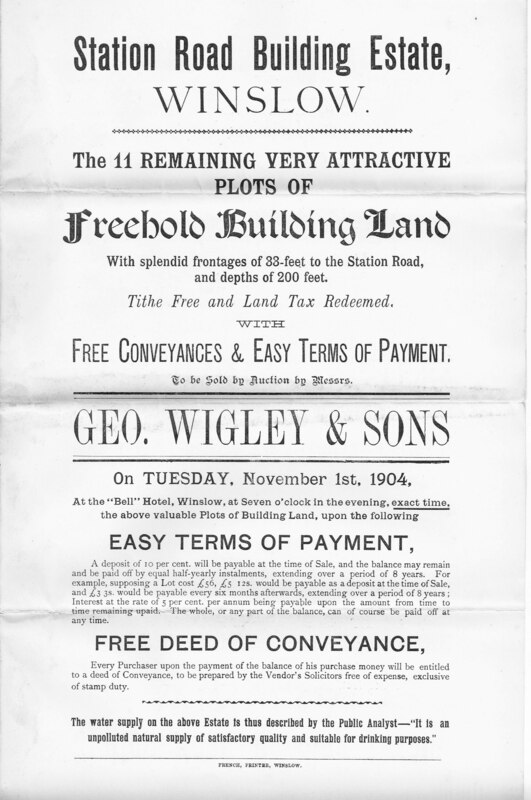 More land to the south of Station Road was sold as garden plots in 1906, and the sale particulars show the layout of the road at that time. This land became the Lowndes Way estate in the 1970s. Click on the images below for the whole sale catalogue ("Occupation Road" is roughly the line of Lowndes Way). The Station Inn is said to have been the birthplace of the pianist Mrs Mills (nee Gladys Jordan, 1918-1978), although her birth was actually registered in West Ham. 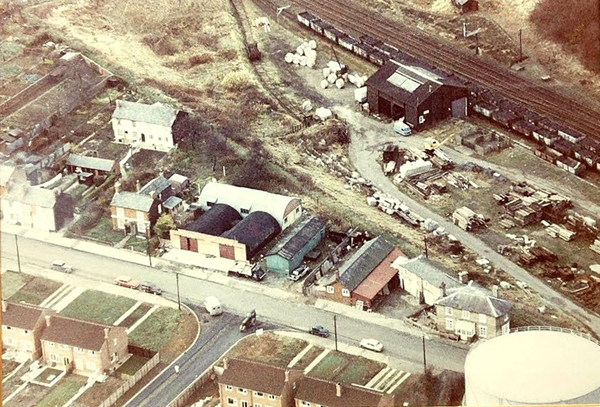 The photo below shows the end of Station Road in 1963, including the gasometer, the former Station Inn, station yard and the buildings on the site of the Creamery, one of which (with the white roof) was the North Bucks Salvage Company run by Teddy Vine.